ANIMAL welfare charity the RSPCA has praised the Royal Navy for saving two baby pigeons from Britain’s biggest warship. The chicks, christened,‘F-35’ and ‘Lightning’, were discovered chirping in a secret nest on HMS Queen Elizabeth as she sailed towards America. 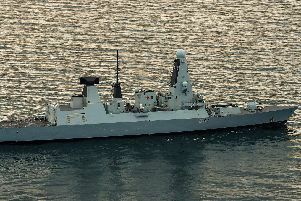 Thought to be just ten days old, the pair were without their mother and taken in by the crew of the Portsmouth-based warship. After being fed, the squawking stowaways flew for the very first time – albeit hitching a ride in a Royal Navy Merlin Mk4 helicopter, from 845 Naval Air Squadron, RNAS Yeovilton. Cheers erupted inside the ship as news broke the chicks had landed safely in Yeovilton. The pair were transported to the RSPCA’s West Hatch Wildlife Centre, in Taunton Somerset, where they will be looked after. Bel Deering, manager of the centre, said: ‘This little pair of baby pigeons are the first in my memory to be rescued from a Royal Navy warship. Vets at the site will monitor the ‘carrier’ pigeons until they are fit enough to fly. The experience has been one that has left a smile on the face of HMS Queen Elizabeth’s crew. Queen Elizabeth left Portsmouth on Saturday evening for her maiden voyage to America, with about 1,500 people embarked on the £3.1bn ship. The 280m vessel will travel across the Atlantic, arriving on the east coast of the US next month where she will begin trials of the F-35B stealth jet. Queen Elizabeth is due home before Christmas.